Community Collaborative Partnerships: The Foundation for HIV Prevention Research Efforts is a must read for anyone interested in developing prevention programs within high-risk urban environments. Illustrative case studies, quality research, revealing personal stories, and helpful tables and figures provide valuable insights on innovative ways to partner in the prevention of the spread of HIV in youths. Leading experts in the field offer practical strategies to dissolve the distrust individuals in a community hold for researchers not a part of that community, fostering an effective collaboration to deal with problems. The book also describes ways to go beyond the United States’ model to reveal how to replicate the same dynamic relationships in international communities. Active participation with the community and families has been found to be vital for the success of HIV/AIDS prevention efforts. Community Collaborative Partnerships: The Foundation for HIV Prevention Research Efforts solves the common problem of forcing ineffective program models onto an unreceptive community. Program developers get the necessary tools to develop relationships and cultivate substantive input from those in the community to help ensure better program results. The research here is up-to-date, and the suggestions invaluable. 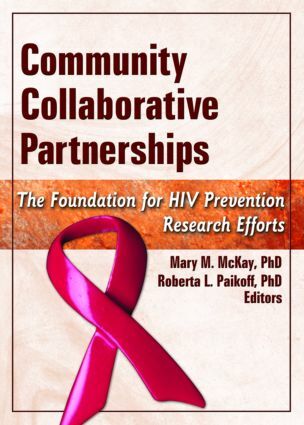 Community Collaborative Partnerships: The Foundation for HIV Prevention Research Efforts is valuable reading for researchers, program developers, community-based organizations, public policy/advocacy organizations, community organizers, educators, and students in the fields of social work, public health, public administration, and community medicine. Creating Mechanisms for Meaningful Collaboration Between Members of Urban Communities and University-Based HIV Prevention Researchers: Mary M. McKay, Richard Hibbert, Rita Lawrence, Ana Miranda, Roberta Paikoff, Carl C. Bell, Sybil Madison-Boyd, Donna Baptiste, Doris Coleman, Rogerio M. Pinto and Willialn M. Bannon, Jr.